ASK RALPH: Another Embezzlement - When will we learn? I read in the News Journal again today about another embezzlement from an area employer by an employee of their business. 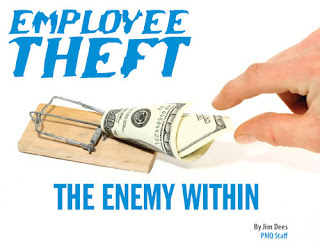 This particular employee stole $900,000 over seven years. This is just another story of local employees embezzling thousands of dollars from unsuspecting employers. I have personally handled several embezzlement cases to the tune of about $1.5 Million dollars during my career. The stories are very similar. It's start with a business trusting an employee to handle sensitive financial affairs and then not following up to make sure that the employee is handling those affairs in an appropriate manner. The case today was probably uncovered when the State of Delaware contacted the employer to request payment of payroll taxes. This seems to be the way most of these cases are finally brought to the attention of the owners or management. Business owners need to take a hard look at the procedures and processes they employee in their businesses and even though we should all have trust in our employees, we need to trust - but verify. I think it was Ronald Reagan when he was dealing with the Soviet Union in regards to nuclear arms reduction who said that first, but he was right on target. As public accountants we can assist businesses in monitoring these issues and develop specific procedures to limit their exposure to these kinds of problems. We cannot uncover everything, but we can certainly develop plans that will segregate duties or outsource parts of the operational chain to limit the ability of exposure to the embezzlement. For example, public accountants can provide monthly bank account reconciliation which will give us a chance to take look at the financial transactions of the business from another perspective and provide some level of assurance that the books are not being manipulated. We can also offer complete payroll services which provide businesses with complete trust that their employees are being paid as directed and that all necessary payroll taxes and reports are being filed. These services are very affordable and certainly cost a great deal less than the thousands of dollars which are misappropriated on an annual basis. I guess we all need to take a hard look at how we run our businesses and find ways to limit our exposure to fraud. We need to be frugal during these tough economic times, but we also need to seek the assistance of experts, like public accountants who can assist in developing programs to ensure continued business success and limit the opportunities for employee theft. If you are interested in discussing this further, feel free to give us a call and we can develop a plan for your business, don't wait until it's too late! Here's a great resource article to review.